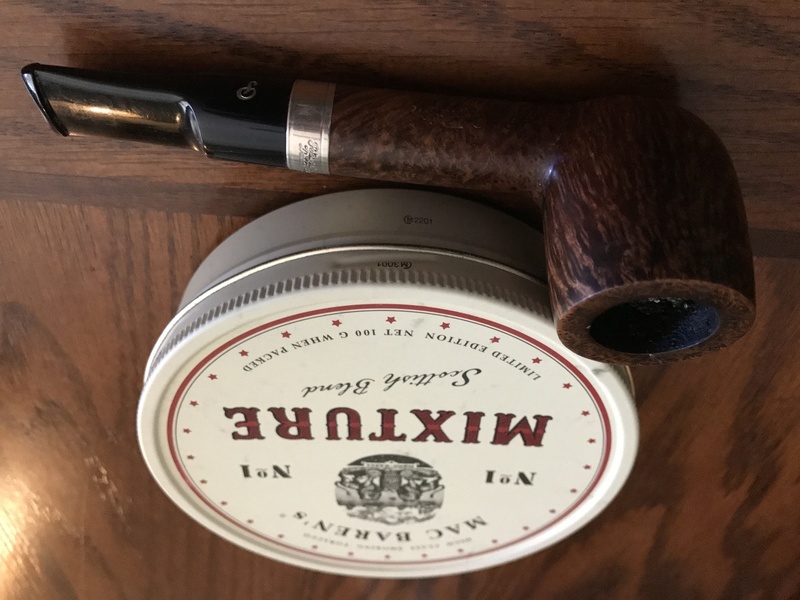 Dug up a tin of MacBaren Mixture from 2006. It took me years to groove the slow cadence needed to enjoy these Danish cavendish tobaccos. I now can actually get a lot of pleasure from them rather than the harsh smoke and tongue bite that rapid puffing produces. Turns out this is a really nice and tasty smoke if ya know how to smoke it. One of my favorites, and apparently one of the world's favorites. I read somewhere years ago that that was the top seller world-wide. Bears an uncanny resemblance to Ed Burak's Connoisseur Pipe Shop house blend of the '70s and '80s. WOW, your sure did find an excellent blend buried in your stash. Yup, it's one of those blends best when slowly sipped. May take a number of relights but is well worth the experience. I was living in Europe when this mixture was the blend most sought after. PS, that's when Peterson made superb pipes!! Yours is a beauty.